Getting cargo up and down stairs has been a beast for as long as anyone can remember. It’s a lot of pulling and prodding and putting unbelievable stress on the steps and your body as you lift and manoeuvre. These stair-climbing trucks are an innovation that makes taking loads up and down different levels as easy as you could imagine. Many times deliveries are made to businesses or homes that require heavy cargo or multiple boxes be taken into areas that are not easy to get to. 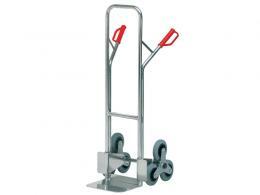 If it is to a multi-level location, the norm has been to rely on a hand truck that has one set of wheels that can only do so much and can lead to harm on the stairs, to the person transporting the items and the risk of the items themselves falling off of the truck leading to their being damaged. With the stair climbing trucks, the wheels have been reinvented and refined to make them user friendly to move up and down different levels. They will be able to deliver and move whatever cargo is needed to that other area easily, efficiency and without any undue strain to the item, the stairs and the person. The stair climbers are excellent for use in multi-level homes, for movers to have on hand on their trucks, delivery services to provide their workers and anywhere that heavier cargo or multiple pieces need to be transported up stairs. Having these trucks on hand provides an exceptional level of comfort that these unwieldy situations will be managed well and to the satisfaction of customers. 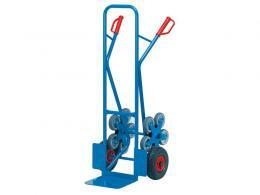 The range of options in our stair climbing trucks assortment is broad and will fulfil whatever needs you may have. We offer manual and electric stair climbers. With each one, the unique multi wheels work together in the exact same way. They move up the stairs almost effortlessly, allowing you or whoever may be transporting the cargo to make minor adjustments to get it to lift easily rather than pulling, prodding and trying to find a workaround for getting into awkward spaces. 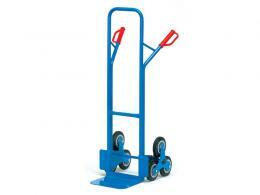 The stair climbing trucks are offered in sizes that will fit whatever cargo you need to move to the next level. Order your stair climber from The Workplace Depot today for free next day delivery to UK Mainland and a one-year warranty on parts and labour. We accept all major credit cards and offer an easy exchange/returns policy.